> I know that just about everyone who has taken a sail on my walap has expressed interest in a small cabin-equipped boat, say 25-26' LOA. I have had my boat out on the bay in 35 knot winds, so do have at least a slight inkling of what needs to be done here; the abeam issue is an important problem to solve, as anytime you get into breaking waves you would not want to lie abeam as an automatic process. I would really like to get someone who has sailed a Russ Brown boat in sticky situations to tell the rest of us how it's done. That would advance the cause quite a bit. > I did cruise a small proa for a couple thousand sea miles, including some days under bare pole in a gale. > SPEAK UP, MAN!!! :-) This is info we would all like to have! How did you handle the situation? I can give you some information on two of those questions in one answer. 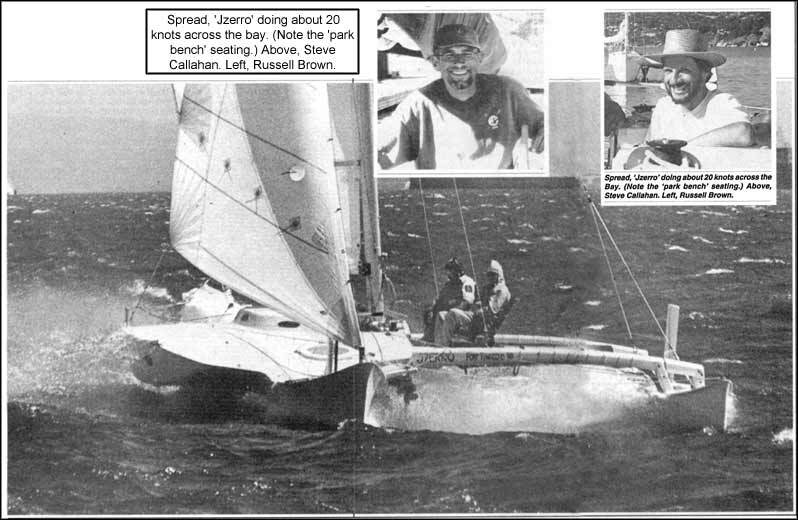 In March of 1978 Russ and I sailed his first cruising proa, Jzero of Polygor, from Ft. Pierce, Florida to Ponce, Puerto Rico. Jzero, was designed by Russ when he was 14 and built when he was 15 to escape (with parents permission) from home. Please understand that this was 20 years ago and most of this is from memory. IMHO Jzero was some of Russel's best design work and worst construction. Main hull without lee buoyancy pod was 30' by 2' and about 29'+ by 1.5' on the waterline. The ama was about 16' and the over beam was about 18' Jzero was mostly 1/4" fir ply and was 800+ pounds empty. We sailed up hill against the current on mostly a one tack beat a few hundred miles out from the Bahamas until we were about 100+ miles north of San Juan in very deep water. A northeaster started to build. These things are hard to estimate or even remember but at its peak, the storm winds reached at least 50, maybe as high as 60. The waves were very high, looking higher than our 28' mast so I would guess some were 20 to 25 feet with some breaking off 5' to 10' of their tops. Bad spot for a lightly built boat. We did not have a sea anchor. We made one out of my spare pair of jeans. A bridle was tied around the waist at one end and around the ankles of the pants at the other. This was tied to our anchor rode but the pants were too light and would skip out of the water when we were on top of a wave and the pull was upward. We added a small Danforth and some chain that I believe attached at the bridle and that mostly held the "sea anchor" in the water. I recall that we discussed bridling the rode off between the aka and the main bow as we thought the downward pull on the ama might help, but in the end we ended up with the rode run off of just the main bow. Jzero rode very well in an attitude with the wind several degrees off the bow on the normal lee side. This put a little load on the ama but mostly just from the windage of the rig. We felt safer to sleep in this orientation. We rode for 2 to 3 days with no real problems. During the day when we could see the waves we would try to steer Jzero out to sea because on our drift course we were headed toward Navidad or where the water of the trench shoaled up to something like 6 fathoms. Luckily, the storm blew out as we were about due north of the Mona Passage. We were pretty tired and decided to run for the Passage and get to the lee of Puerto Rico in case another storm came. The Mona was quite roiled with a full blown refraction pattern consisting of two sets of fast, sometimes breaking swells with about a 45° to 90° angle between them. On almost a dead run in these seas in pitch black night, with a deep reefed 60 square foot main up, we covered 31 nautical miles in 2 hours flat and rounded the corner into the lee to get some rest. Jzero performed almost flawlessly the whole time. I was so impressed with this simple little boat that I drew up a very small 46' big sister as soon as I got home. I have never had the time to build it but would still like to have one some day. Jzero was built for $400 and I helped Russ re-rig her in FL for about $800. She was the most impressive $1200 boat I ever sailed. Before the storm we had two really good days of steady wind close hauled on port tack. I couldn't get a sight for 48 hours but finally did and we had covered 360 miles under working sail of about 200 square feet. Aside from being wet, it was a comfortable ride. 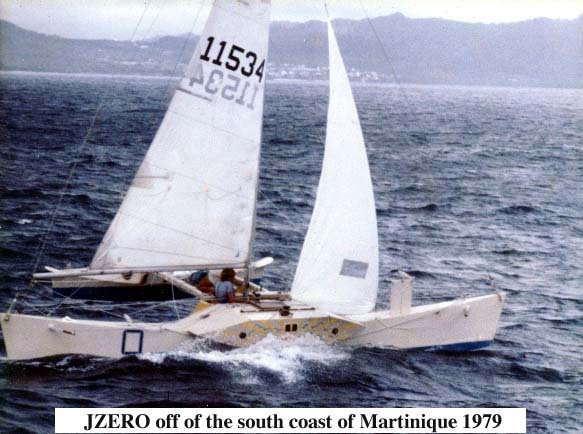 Just to give another example of her performance, later, in the St. Maarten Tradewinds race on a leg from Virgin Gorda, around St. Croix, to Martinique, about 350 miles essentially a one tack beat, Jzero finished third, I think less than 2 hours behind the leaders. 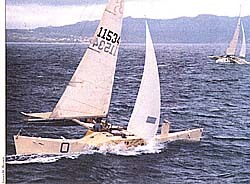 The two lead boats were Rouge Wave sailed by Phil Weld and a 60 ft Peter Spronk cat (designed built owned sailed by Peter). I was crew on Third Turtle, an open wing 31 Val tri and we were hours behind. Sorry to have rambled so long, I am afraid I get carried away on this subject. > it would ever have large scale commercial appeal. Funny you should mention that, the reason I don't have a proa now is that I spend all my time developing and building equipment to convert kayaks and canoes into mostly multihulled sailing boats. I finally found something more minimal than a proa to divert my attention. My current cruising tri only weighs about 95 lbs empty and can travel to windward at several hundred knots (in the belly of a jet). Makes those long windward slogs more comfortable. > As far as I know, Russ is the only one with more than one or possibly two boats to his credit, but he is "rather hard to contact." At last count, Russ has designed at least 4 cruisers that have been built, After Jzero came Kauri, then Lou McGregor built Cimba?, Russell is now cruising the west coast on his latest which I think is also a Jzerro. I think these are all around 37'. There may be more. I keep up with him through his dad. 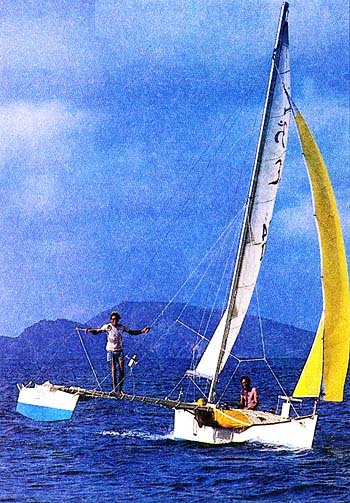 I have only sailed briefly on Kauri and it was a totally different boat than Jzero, much larger and more powerful. If anyone has any photos or drawings they would like to share of small cruising proas, I would really like to see them, contact me directly to my . Even a small jpeg photo would be great. Thanks for all the discussion, it is good to find a place where proa is spoken. > occurs to me that many people reading the Multihulls list don't know what Russ Brown's Jzero looked like. Assuming people can picture a long slim hull with a small outrigger, could you describe the rig, and how the boat was shunted? Were there any particular problems that you guys ran into when "coming about"? Did you ever have to -- hmmm, I'm not sure there's a word for this -- "wear ship back around" because you got pushed around so the ama was to leeward? Will do my best, but might be good if anybody has specific questions of general interest to ask narrow questions. I am afraid that I am not the elegant, succinct, concise, writer, that you have in John D and others, so be forewarned that what should take a few sentences will likely run way too long. I am why they added the delete button. The short answer is: Jzero was sloop rigged. She shunted as described in the text books except that you raised one rudder and lowered the other (instead of a steering oar) and just re-sheeted the main to the other end of the boat. No she didn't have any real problems shunting or in getting caught aback. For those of you wanting a more detailed answer, read on. 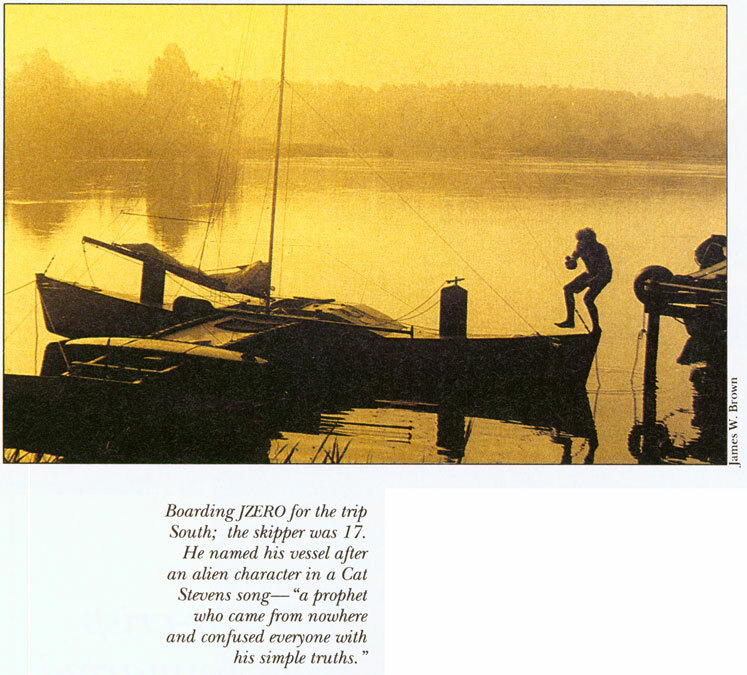 For those who have access to the issue of Woodenboat #83, July/August 1988 as mentioned by Gary Dierking's post, there are some nice pictures of Jzero and her rig. By far most of my miles on Jzero were sea miles, so I don't have much experience in short tacking or close quarters handling. Before we left the Manatee Pocket in Port Salerno Florida on our way to Ft Pierce to sail into the Atlantic, I had maybe 2 hours experience in proa sailing. There were two very similar rigs on Jzero. When Russ left Virginia he had the original rig. Russ was only 15 when he built Jzero and much of the rig was chosen for its cost (Jzero cost less than some of us spend on foul weather gear). The mast was a Hobie cat mast with an extension added and the main was a used sail off of some 20-some foot monohull. I don't know what the headsails were. When singlehanded off of Stuart Florida in the Gulf Stream, Jzero struck something in the dark which broke off the akas and dismasted her. Jzero floated upright leaning on the pod and Russ lashed it all together and was later towed into the Manatee Pocket where I met him. I had a private boat shop and I let Russ rebuild Jzero's structure using my shop and materials in exchange for a ride to the Caribbean. At that time she was fitted with new, much stronger akas, a new larger section aluminum mast, and new tramps, canvas and headsails. Russ also added watertight bulkhead hatches just inboard of the rudder trunks. Jzero was essentially sloop rigged but in an unusual way. She had a very full cut monohull main so we had to fit a mast bending tackle to flatten the main for windward work. The working jib was a sail originally made for a Highlander class dinghy. It was set flying with the tack set to leeward of and slightly forward of the mast with minimal overlap. There was a nylon reacher/drifter cut to be tacked out to the bow and usually hanked onto the headstay. For close tacking, the headsails were left in the bags. You simply pulled the continuous main sheet from one end to the other for shunting (tacking or jibing). Jzero was a wonder of simplicity. 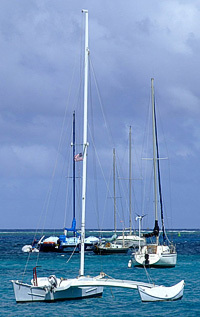 The main boom was set on the mast with jaws made from bent aluminum straps. The jaws were bent to a curve that was set to limit the rotation of the oval mast. 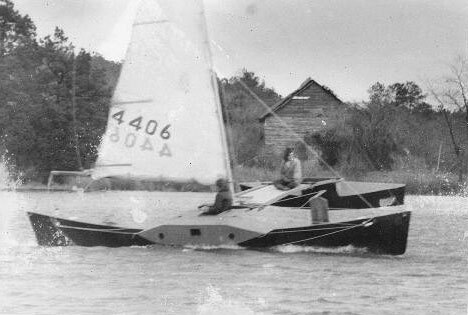 Most of my sailing experience prior to Jzero was on racing dinghies and conventional trimarans, mostly Pivers (this was 1978). To a non proa sailor the strange handling at first seems awkward but as you learn about it, many of the awkward parts turn into advantages. A couple of examples would be as follows. In a crowded harbor, I have found that dropping a mooring or picking up an anchor on a Tri can sometimes be dicey (I never seemed to have a motor). You often have to back off with reversed rudder until the sails fill and hope and pray you gain enough way for steerage before you poke multiple holes in the mega yacht moored next to you. 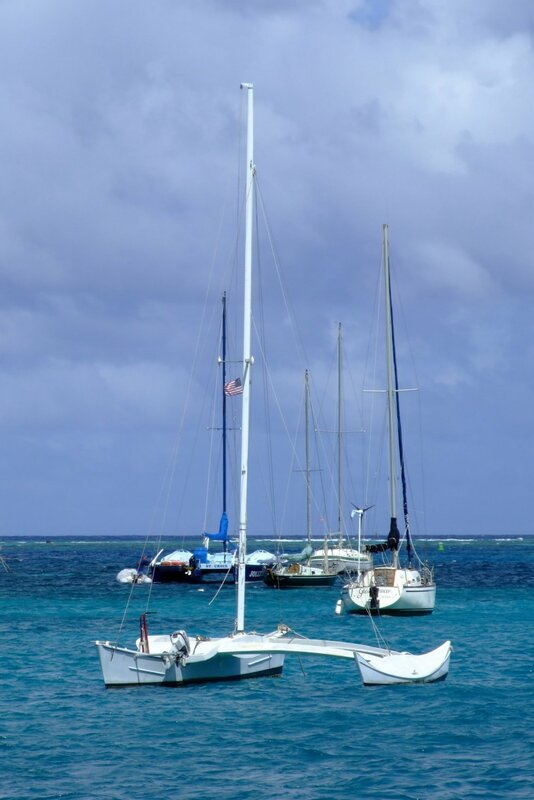 On a proa, you raise some sail, pull up the hook, sheet in and sail downwind, bow first out of the mooring. That simple. I recall needing to pick up something at a dock in Martinique The dock ran parallel to the wind and had a spot on the side between two boats. Without an engine in a conventional multihull it would have been involved to luff up and slide into the slot without a lot of hassle and worry. In Jzero, we reached in under main with me standing on the bow. As we approached the dock, Russ let out the main, then sheeted it in, backwinded just enough to slow us to a stop 12" from the dock where I grabbed the item from someone standing there. Russ continued to sheet in the main on the new tack and we backed out just like water ballet. The only thing that always seemed odd to me was the proa version of jibing. Tacking was easy and seemed natural. Jibing was awkward to me to the end of my times on Jzero. The closest I can come in explaining it to non proa sailors is that it is like driving down the street, pulling into a driveway, then backing out into the street traveling in the same direction as originally. In tacking you at least went off in another direction, the action of changing the ama to another side downwind seemed complicated compared to other things on a proa. If you had to tack with headsails, they were normally dropped, moved, and re-hoisted. The geometry of the jib in relation to the main was interesting to me. The jib was set flying a few feet to leeward of the main and that allowed a very wide slot. I often felt that due to the angle of the jim to the mast, the jib might also be acting slightly as a lifting sail. The result was that it seemed you could drive Jzero pretty hard with the jib set without as much additional heeling as one might expect from the extra sail area. I seem to recall the jib was about 80 sq. ft and the main only 120, so when the jib went up it was like a supercharger. She pointed well but was exceptionally sensitive to pinching. See below. > "wear ship back around" because you got pushed around so the ama was to leeward? We never really got caught hard aback. The mast wasn't stayed very strongly from the lee side so that was one thing you really tried to avoid. The worst vice Jzero had was me. Russ would probably come onto the list just to agree to that (you out there Russ?). I was used to sailing conventional boats and had a lifetime of second nature reactions to eliminate. Jzero had an unusual lateral plane, one that I would not have thought would have worked as well as it did. When sailing to windward the forward dagger type rudder was trunked. The remaining skeg rudder was pretty far aft in relation to the sails and the hulls lateral plane. The rudder was below a spot about 3/4 of the way aft on the mainsail foot, probably about 75% of the way aft on the hull. Almost all of the sail area was forward of the only fin. I think when sailing to windward the sharp fine hull with some forefoot did a reasonably good job of gripping the water but was obviously a very low aspect foil (29' long and 18" deep). The result was that if you pinched it up too tight, the hull "foil" would stall and she would sometimes loose way before you could get her back on course to re-establish lift from the sails and from the unusual underwater parts. The worst of this for me was as the gale built. I was alone on deck in very rough and sloppy condition in pitch black so it was hard to see anything of the waves. This was before the big swells got established. It was very gusty and shifty and in the gusts I was way overpowered but too out of control and lacking in Jzero experience in those conditions to figure out how to safely reef just then without calling Russ on deck. A hugh gust would hit and Jzero would accelerate like a rocket and buck like a horse in the rough water. My instincts made me luff through the gusts, but I stalled the foils over and over again. I had a real fear of getting caught aback that night, but when you luff to a stop you just back up with the rudder reversed until the ama is to windward again and then slowly sheet in until flows were established again. This (or I) was Jzero's only difficult trait and I always wondered if having even a small fin more under the rig to change the nature of the foil stall would have made her better mannered. I felt bad about having to call Russ on deck to reef, but when he came up, we agreed that it was time to heave to and we took down all sail and started to figure out a sea anchor. The point being that when her handling got that difficult, it was time for most boats that size to quit sailing. Jzero only got knocked down twice while I was on board, both times my fault. After the gale we were working down the lee coast of Puerto Rico in light to no air with main and drifter up. I was tired and alone on deck and it was very hot. I dozed off after some hours of this. One of those sneaky gusts rolled down the adjacent mountains and hit poor Jzero beam on with her negligent sleeping helmsman and both sails sheeted and cleated. As I woke up we were sailing along at several knots heeling over maybe 30° leaning on the lee pod with Jzero totally in control. I slacked the sheets and she fell back onto her feet. The other time was years later and was much the same except rather than sleeping, it seems I had suffered a mild concussion from a knock in the head from 30 foot long spinnaker pole while a guest on the huge monohull, Vendredi Treize. The result was much the same as I was not as aware as I should have been in light air with the drifter up. Jzero caught another gust and simply heeled over onto the pod and sailed on until I came drifting back to a more normal awareness. I had always feared that heavy weather would be the cause a knock down but it was always light wind and my negligence that caused it so the knockdowns were gentle, controlled, slow motion type events. My impression was that Jzero was far more able and forgiving than my previous experiences ever prepared me for. Even with full sail and a negligent or inexperienced helmsman Jzero handled herself very well. I thank Russ for the opportunity to sail on Jzero on two cruises. I have been a proa enthusiast ever since. In the years afterward as I absorbed the experiences I decided that with my own level of seamanship that given the opportunity, I would like to own a proa as a normal cruiser. I did however decide that for me, a crew of 2 was advisable for offshore passages. This was a hard compromise for me as a crew was not necessarily compatible with my personality. Plus, as Russ found out, an experienced proa crew is hard to find. I would still consider a proa cruiser, but for the time being, I am working on smaller cruising multihulls for myself. Thanks for the opportunity to yarn.